Cozy quilt for the Christmas eve. 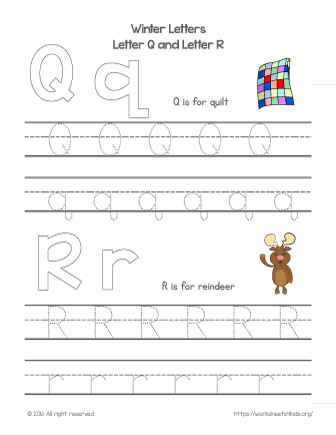 Decorate the letter Q and letter R with Christmas colors. Make your learning process fun with this colorful activity. Learn letters, winter related words and keep little fingers busy all the time. Tips: color the letter using crayons, place a play dough to make an outline of the letter and decorate it on top, glue your favorite stickers or pom poms inside the letter. Find your favorite way and share with us!